Sweet potatoes are a great addition to any diet and so versatile in the many ways they can be prepared. Whether you are eating candied yams or sweet potato casserole, clothing stained with the rust colored potato can be hard to restore. You may need to use mild bleaching solutions to fully remove the stained area. And make sure that the stain is completely removed before you dry it since there can be a faint brown area that only shows up when fully dried. 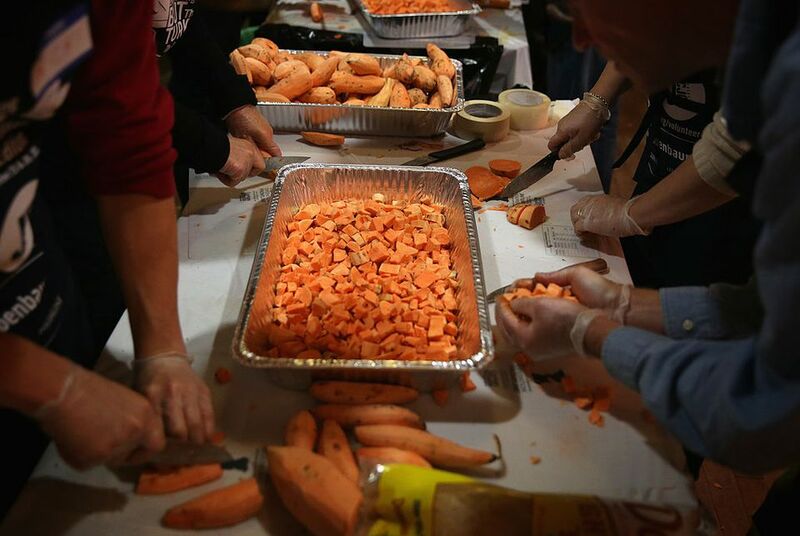 Using a butter knife or a spoon, try to remove any of the sweet potato that is left on the clothing. Extra food will smear and could potentially get onto clean areas of the laundry during stain treatment. It's best to get rid of as much of the extra as possible. Don't scrub too hard at the stain, depending on the fabric type, you could damage the clothing. Run cold water through the back of the stain as quickly as possible. This will force the stain back out through the fabric. You don't want to go through the front of the stain. Also, don't use hot water, which might set the orange and brown stain onto the fabric. The next step is to get a liquid laundry detergent onto the stained area. Most liquid laundry detergents will work to penetrate into the stained area and loosen up the food particles. Work the detergent in gently to the stain. If the garment is white, or you have tested it for colorfastness, apply a mild bleaching agent like hydrogen peroxide or white vinegar with a sponge. Allow the item to sit for up to five minutes before rinsing thoroughly. You can also use lemon juice to clean the stain, but only on white fabrics. It will bleach out any fabrics with patterns or colors. Repeat with the detergent step followed by the mild bleaching agent step until the stain no longer appears. Be sure to rinse thoroughly between steps. You may need to keep repeating these steps until you can no longer see any stain remaining. Before applying any other treatment rinse completely. If the stain still remains, apply a stain remover stick, gel, or spray and allow it to sit for at least 5 minutes. Wash normally. If the stain still remains, rub detergent into the stain and soak in warm water for 30 minutes. Rinse well. If the stain remains, apply stain remover stick, gel, or spray and wash according to directions. After you take the clothing out of the washing machine, and before you throw it into the dryer, you'll want to check very closely for even the faintest hint of a stain remaining. Often the middle of a stain disappears with a slight discoloration on the edges of the original stain. Be sure it has been completely removed. If needed, repeat the steps above again to make sure the stain is completely gone. To be extra diligent, allow the stain to air dry first. If after air drying, no stain remains, you can rest assured that it is now safe to wash and dry normally.